We are looking to recruit a Fetal Medicine Consultant for a brand new state-of-the-art private hospital in Dubai, scheduled to open in late 2019. To be eligible to apply for this role you must hold CCT, be on the GMC Specialist Register and you must be able to obtain a Certificate of Good Standing. Dubai is the largest and most populous city in the United Arab Emirates. On the southeast coast of the Persian Gulf it is the capital of the Emirate of Dubai, one of the seven emirates that make up the country. 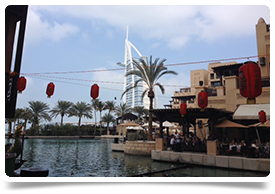 Dubai is extremely well known for its warm hospitality and rich cultural heritage. With year-round sunshine, intriguing deserts, beautiful beaches, luxurious hotels and shopping malls, fascinating heritage attractions and a thriving business community, Dubai receives millions of leisure and business visitors each year from around the world. Dubai has attracted world attention through large construction projects and sports events, and in particular the world's tallest building, the Burj Khalifa.